Shelley Showers became a member of the Philadelphia Orchestra in 1997 after serving as Acting Principal Horn of the Cleveland Orchestra. 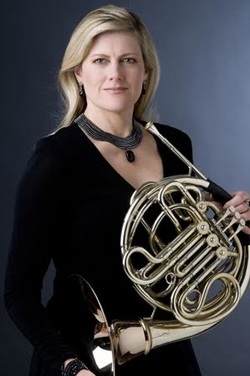 In 1997, she played Principal Horn on the Grammy-Award winning Cleveland Orchestra recording of the Berlioz Symphonie Fantastique under the direction of Pierre Boulez. Prior to that, she was Principal Horn and soloist with the Utah Symphony. She began her career with the New Jersey Symphony, and subsequently was Acting Associate Principal Horn of the Cincinnati Symphony Orchestra. A native of Lancaster, Pennsylvania, Ms. Showers earned her Bachelor of Music Degree from The Curtis Institute of Music. Her teachers included Mason Jones, Myron Bloom, Nolan Miller, Randy Gardner, and Stephanie Fauber. As a student, she performed at various summer music festivals and won solo contests in Texas at Southern Methodist University and in California at the Music Academy of the West. She has performed with the Pennsylvania Ballet, Concerto Soloists of Philadelphia, American Ballet Theater, Solisti New York, and the New Haven Symphony, among others. Ms. Showers has performed solo recitals at the International Horn Symposium and at the International Womenʼs Brass Conference. She has participated as a chamber music performer in the Deer Valley International Chamber Music Festival, the Nova Series, and the Utah Music Festival. She has also participated in the Aspen Music Festival as Principal Horn/ faculty member/ chamber musician, and the Kent/ Blossom Music Festival as faculty member/chamber musician, and she was on the faculty of the Cleveland Institute of Music. Ms. Showers is currently on the faculty of Temple University Boyer College of Music and Dance, where she is a member of the Conwell Woodwind Quintet. She also performs on the Philadelphia Orchestra Chamber Series. Ms. Showers is a member of the Board of the Philadelphia Orchestra Retirees and Friends. She also served on the Board of Trustees of The Curtis Institute of Music where she was Alumni Council Representative. Ms. Showers began her committee work at Curtis by serving on the Annual Fund Committee, and currently serves on the Student Life Committee. ​See this blog post featuring Shelley.